Let there be noise! That’s what the city of Brooklyn has ruled after neighbors of Brooklyn’s P.S. 139 playground requested that it be closed on Sundays to allow them some peace and quiet. After the city informed residents that the playground would stay open, some threatened to resort to Plan B: file a lawsuit. We do sympathize with the neighbors’ concerns. The playground, which is part of a public school, has recently been opened to the general public on evenings and weekends as part of Mayor Bloomberg’s "Schoolyards to Playgrounds" initiative. That means increased and prolonged noise for the surrounding community. And as if playing children aren’t noisy enough, the U-shaped building that encloses the playground amplifies their screams and shouts. But—and yes, there is a ‘but’—as much as adults need their rest, children need to play, every day. The weekend offers them unstructured time to do so, and should P.S. 139 close on Sundays, some kids would miss out on a vital opportunity to run around, socialize, and unleash their creative juices. One neighbor claims that the noise is a health issue, telling the New York Daily News, “It raises my blood pressure.” Do you know when else causes high blood pressure? Lack of exercise. And as childhood obesity increases, so do rates of hypertension amongst our nation’s little ones. Daily outdoor play is absolutely essential to our children’s health and well-being. "I AM A CHILD AND I LIKE TO MAKE NOISE!" Photo by Jari Schroderus (cc). P.S. 139’s neighbors, while rightfully frustrated, seem to be pitting the interests of the children against their own, rather than finding a common way forward. Can the city employ soundproofing techniques to decrease noise levels? Can the weekend hours be reduced to give nearby residents a bit more rest? 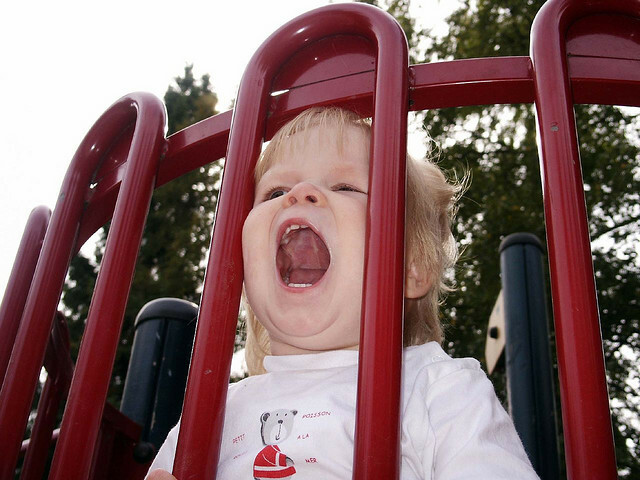 Can volunteers form a playground watch to help monitor excessive noise? If all other options have already been explored and the only avenue left for residents is to sue, well then, it is their inalienable American right, for better or for worse. Let’s just hope they never move to Berlin, Germany, where children have been legally granted the “right to be noisy.” That’s right—in Berlin, a child’s right to play trumps an adult’s right to peace and quiet—and even an adult’s right to sue. Help us ensure that ALL children get the space, time, and permission to play! Take action today at SavePlay.org. "Playground is blocking my view"